Wordpress – Jane Talks Tech! For performance reasons, it is not a good idea to start your permalink structure with the category, tag, author, or postname fields. The reason is that these are text fields, and using them at the beginning of your permalink structure it takes more time for WordPress to distinguish your Post URLs from Page URLs (which always use the text “page slug” as the URL), and to compensate, WordPress stores a lot of extra information in its database (so much that sites with lots of Pages have experienced difficulties). Didn’t annoy my visitors: For sites with less than 100 visitors daily like mine, I was not going to lose any money or get irate messages. However, I didn’t want to chase away the few visitors I have by throwing up a bunch of 404 – URL not found” messages. Instead, I needed to make sure I had a way to let them know that there would be a temporary break in “transmission” (so to speak). To do this, I needed to perform the change at a time when I had the lowest traffic volume. Again, I don’t make much money from this site, but if I did, it would not be smart to change my site’s links during the times of heaviest traffic! Had a plan for a seamless redirection: This was the biggest issue I needed to take care of before pulling the switch on my site’s structural change. I needed to make sure that the old posts were properly redirected i.e. a 301 redirect which tells Google/Search Engines that the old stuff is now at a different site. This is what Google recommends when you change a site or page’s url. Exported my site’s contents in the WordPress WXR format and backed up my site’s database for good measure. It’s just good practice to have backing up data as a first step. Typed out an entire listing of my site’s posts by looking at my site’s Archives, grouped them by year and with a simple “search and replace” command in gedit, added the year (in which the post was written) to the URL so that janetalkstech.com/the-motorola-atrix became janetalkstech.com/2011/the-motorola-atrix. For each cell, enter the source/bad url, add a comma and then enter the target/good url. Move on to the next cell below; Rinse and repeat. You can verify the correct syntax for creating the redirect entries manually by exporting your current redirects from the Redirection plugin‘s “Modules” tab. Double-check your work to make sure you have the correct redirections in your CSV sheet before importing! I ended up with 122 cells containing redirects to the new URLs e.g. Installed the WP Maintenance mode plugin for WordPress and turned it on. Make sure you change the “Settings” for the Maintenance Mode plugin to “True”. Then, I changed my site’s permalinks by going to “Settings” and “Permalinks” while in the WordPress Administrative backend and entering “/%year%/%postname%“. I didn’t want trailing slashes at the end of my posts so I left out the trailing slash at the end. In my naiveté, it seems the current recommendation *is* to have a trailing slash at the end of URLs although that article is over a year old although Matt Cutts says the trailing slash doesn’t matter as much as picking the desired url style and sticking with it. I verified that all my links were being properly redirected by clicking on old links and casually inspecting my site’s HTTP headers (using Wireshark). So, I was reasonably satisfied that my links and corresponding link juice were being passed on to the new URLs. Turned off the WP Maintenance mode plugin and closely monitored my logs for any unusual drops in traffic. Over the course of 7 days, I completed the migration of this site from Habari 0.7 to WordPress 3.1.2. I ultimately came to realize that I needed to spend more time writing my blog posts and less time fiddling with my site or theme. In the end, I needed a fully baked CMS as Habari was still a little too ‘rare’ but the Habari CMS will always be on my radar. I knew this sad day would come and I already talked not-so-seriously about it with my post about navigating with Habari. Here, I will talk about the little issues that made my decision to switch somewhat easier, what it took to move my site from Habari back to WordPress, automating the process, more caveats as well as as some interesting things I miss about Habari! Jane publishes a post and links to 1 or 2 more posts written by her. Jane may edit published post and through changing post title, may inadvertently change the slug for the post. As Jane discovers during her migration back to WordPress, there are several broken links in pingbacks/trackbacks that could only arise as a result of post title/slug change. Be careful in changing the titles and inadvertently changing the slug for already published posts because your pingbacks/trackbacks may not be updated. Threaded comments: When I switched from WordPress to Habari, I lost the threaded comments I had but I wasn’t too broken up about it. I kept the Habari commenting system and after a couple of months, I enabled Disqus commenting on my site. Unlike the Disqus plugin for WordPress, there was no feature in the Habari Disqus plugin to migrate existing comments to the Disqus system so comment management for my site was a little split between checking Disqus.com for moderated comments and checking on my Habari comment management page (because on posts containing existing WordPress/Habari comments, the Disqus commenting box did not appear which was intended behavior). I got over this but I sorely missed having the fully fledged Disqus plugin for WordPress. This would NOT be an issue for someone starting a brand new blog without comments. For someone with an established blog & comments, I would definitely recommend LOTS of testing before migration. Social media: There are plugins available for viewing/inserting tweets, sharing blog posts, etc. Code sharing: There are plugins for embedding source code in blog posts, and many other plugins on the Habari distribution hub. However, WordPress wins out when it comes to the amount of customization that is possible with the help of plugins and I have truly come to appreciate the more mature plugins for services like Google Analytics, SEO, etc which keep me in my dashboard and help me continue to write. Create a new directory on janetalkstech.com. Downloaded a copy of WordPress 2.9 from the WordPress release archives as I saw no reason to tempt the gods by attempting the migration with a version of WordPress *he* didn’t use. Installed WordPress; This version will use the default “admin” username so I made sure I created the same username I had with my Habari installation and made that username an “Administrator”. Well, you dump it in your Habari root directory, edit the array at the top so it can connect to the MySQL database your WordPress instance is installed in, and you load it up in your browser. You should see a bunch of junk about things it finds – and hopefully no MySQL errors along the way. Uploaded the edited WP migration script to my Habari installation at janetalkstech.com and *hopefully* no major errors in your case. In my case, a ‘major’ problem was the fact that my tags weren’t imported but I was just euphoric that I didn’t run into any “showstopping” bugs. Upgraded the test site to WordPress 3.1.2, blocked search engines from accessing the test site to prevent duplicate content problems, turned off commenting/pingbacks/trackbacks because this was a test site and installed tracking code (Google Analytics & StatCounter) to keep tabs on the visitors to the special test install site. 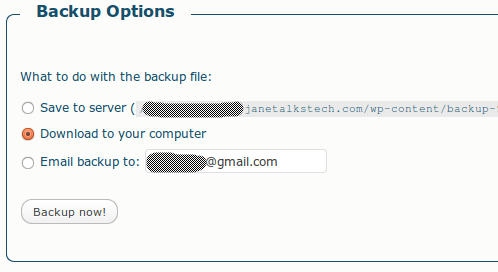 Installed the WordPress DB Backup Plugin and User Role Editor plugin. These two plugins will save you heartache. Just do it now and thank me later. When I started the move, I had exactly 1, 111 tags in my Habari database and over 150 posts. The WordPress migration script did not import my tags and accordingly could not associate the posts with the tags. This was depressing because I was looking at *hours* of copying & pasting and doing tedious data entry. So, what did I do? Elance: Before all of this began, I initially created a job on Elance asking for a developer to take care of the mess for me. I got bids ranging from $200 to $300 from non-US based workers. As I was able to get my posts/comments/pages imported, I then created a new job asking for data entry work to add tags & associate the posts with corresponding tags. I got bids for this job ranging from $50 to $250. I wasn’t happy with the workers that were bidding on my jobs so I eventually canceled my jobs and decided to give Amazon’s Mechanical Turk program a try. Amazon MTurk: The website to sign in as a “Requester” is https://requester.mturk.com. The website is rather confusing so I recommend you skip straight to “create a hit individually“. You will be asked to pre-pay for your HITs so make sure you have your credit card info on hand or on your Amazon account. Err on the side of too much information. 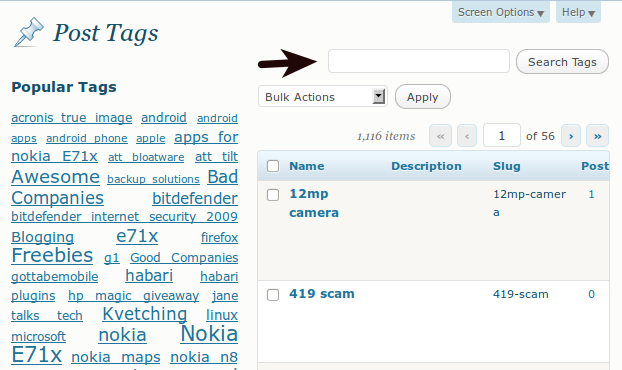 I created 2 jobs: one was asking for the creation of my 1, 111 tags based on the live site at Jane Talks Tech! for $10. 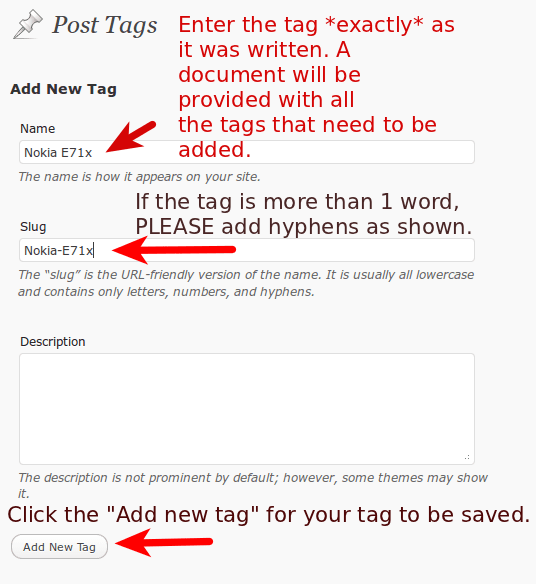 I created screenshots showing how to create a tag, properly create the slug and submitting the new tag. The other *very* important thing I did was install the User Role editor plugin for WordPress. I didn’t have any extremely sensitive information in my drafts or blog posts so I wasn’t too worried about granting someone access to my test site. However, the User Role Editor allowed me to make sure the new user was was only able to create tags! Once the tags were created properly, the worker was paid. This worker was able to complete the job in less than 3 hours so I wasn’t left in limbo. The other job was for updating the posts with the created tags based on the archives at Jane Talks Tech! After Worker #1 was done, the next Worker to accept my HIT was to work on adding the tags to each post on the test site. Again, I created screenshots showing exactly how to do this and the worker was able to complete this task in less than 24 hours!In summary, for less than $25, I was able to get the 1, 111 tags created and added to the correct posts via Amazon’s Mechanical Turk program. backing up my WordPress database files via PHPMyAdmin where I downloaded the entire database and via the WordPress backup plugin three different ways: email, server and download. It is also a good idea to export your content using the built-in WordPress exporter which outputs a WordPress eXtended RSS file. The idea being: if something goes wrong, you can always fire up another WordPress instance and get going without having to start from a blank/fresh WordPress install. Cleaning Up & Watching Out! This part cannot be outsourced, in my opinion. So plan on having 2 – 4 hours to spend on fixing and getting things just right. My major concerns once I had my posts, pages, tags and categories set up properly were making sure: embedded/linked image paths were updated, internal/external urls were updated & functional, updating my sitemap and migrating my comments to the Disqus commenting system. Installed the Broken Link Checker plugin for WordPress which alerted me to more broken image paths and I was able to use the Search Regex plugin to replace the links if there was a pattern. As I’ve become accustomed to, I backed up my database files before and after running this plugin. Update Links: The Broken Link Checker plugin was invaluable during this process particularly because it let me update the link without manually editing each post! This link checker works on all internal and external links so make sure you don’t constantly ask the program to crawl your links. 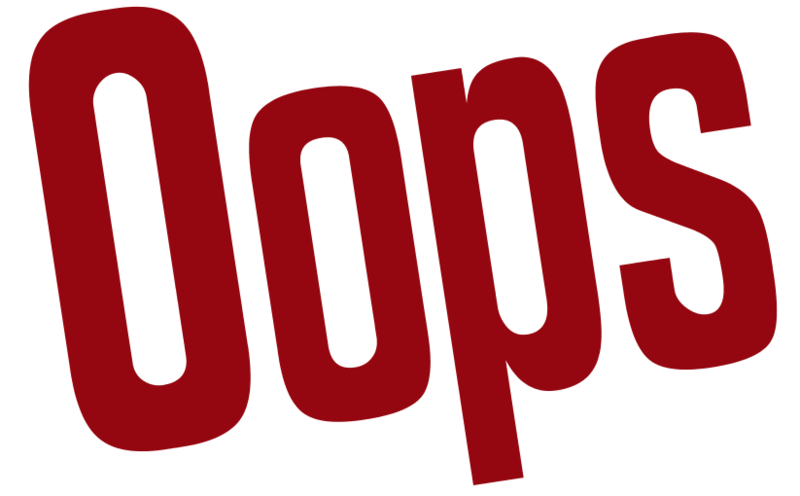 There are more ways to check your site for dead/bad links but for immediate results or a snapshot of how bad things are, you cannot beat this simple plugin on small sites like mine. Another useful feature of the Broken Link Checker plugin is that it also detects redirected links. That was how I discovered over 200 internal links which had a slash at the end. This is probably a WordPress-related matter, but with the Broken Link Checker plugin, I was able to update the links with the canonical urls and avoid the extra slash. Thanks to this plugin, I was able to weed out several dead external link and discover several bad pingback/trackbacks that were hold-overs from my Habari days of broken trackbacks/pingbacks. Updating Your Sitemap: With the help of Yoast‘s WordPress SEO plugin, I was able to make sure that my site was verified with Google Webmaster tools, Bing Webmaster tools and Yahoo Site Explorer. I was also able to regenerate a sitemap of my site and resubmit that to the search engines. The WordPress SEO is a very polished plugin that does more than generating a sitemap; It helps you optimize your site and each post or pages for select phrases/keywords! Switching Comment Systems: This was probably the easiest part but nonetheless still nerve-wracking for me. As I alluded to, the official Disqus plugin for WordPress automagically imports your comments into your Disqus profile. I absolutely love Disqus because it allows you to get a fuller picture of your commenters and they’ve proven themselves honest by allowing you to export your Disqus comments back to your WordPress database or exporting all your comments to an XML file (which I am reasonably certain will be supported by whatever other CMS usurps WordPress’s throne). To assist in the management of media, such as images, video and audio, Habari provides a mechanism for defining virtual filesystems for media, called Media Silos. A silo provides a consistent interface for dealing with media. Speed/Errors/Timeouts: The Admin backend for Habari loads drastically faster than WordPress’s. 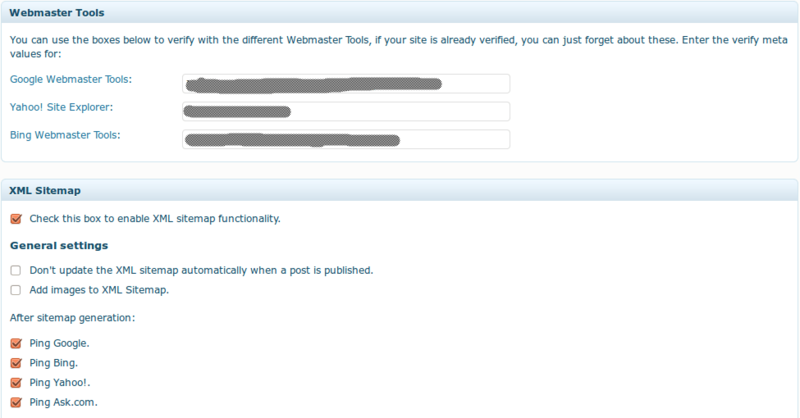 Oh, and don’t get me started on the errors I get even when trying to view my Admin page in WordPress! I’ve already had more 404 errors in the course of saving or doing anything in the WordPress backend this week than I have in the year of using Habari. Crazy, but again, I am aware that I’ve made some stability trade-offs in moving to WordPress because I want in to the WordPress plugin/theme ecosystem. 🙂 In fairness, WordPress is now a fullblown CMS whereas Habari can be called a minimalist blogging system. 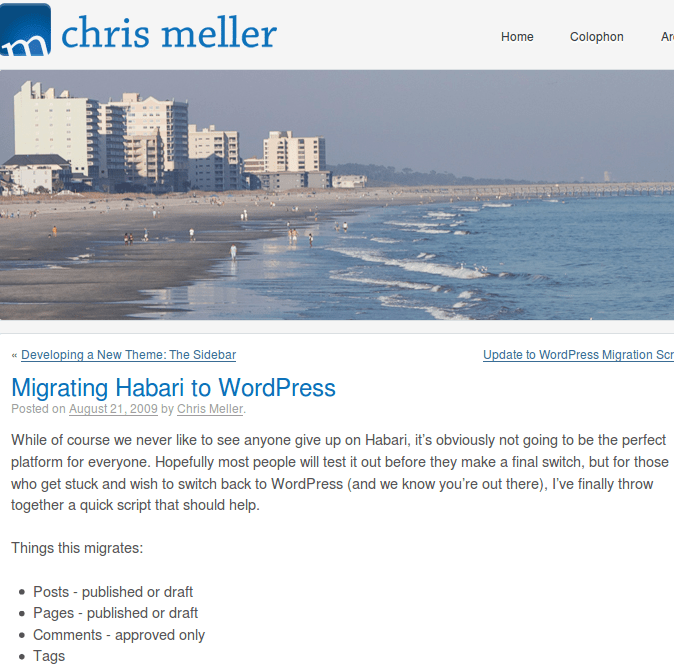 Overall, I’m very pleased that my migration from Habari to WordPress went smoother than I imagined. I didn’t have to visit IRC once or send flares into the digital universe. 🙂 If you have any questions/comments, drop a note & I’ll do my best to answer.